HOBART, Tasmania, Australia, February 4, 2013 (ENS) -- The month of January, usually the prime whale catching month for the Japanese whaling fleet in the Southern Ocean, has come and gone without the death of a single whale, says Sea Shepherd Conservation Society Australia Director Jeff Hansen. It is the international organization's ninth Antarctic Whale Defense Campaign, Operation Zero Tolerance. This season's campaign is under the direction of Sea Shepherd Australia, now that founding president Paul Watson has handed authority to Hansen and former Australian Greens leader and senator Bob Brown. Authority was transferred in December in compliance with a U.S. court restraining order and after Watson's escape last summer from Germany, where he was detained on bail for possible extradition to Costa Rica. The Sea Shepherd fleet of four ships, one helicopter, drones, and more than 120 volunteer crew from around the world has to date succeeded in keeping the four-vessel Japanese fleet of "research" whalers separated on the run, making it impossible for them to catch whales, Hansen says. As an observer, Watson remains aboard the Sea Shepherd vessel SSS Steve Irwin, named in honor of the late Australian naturalist and broadcaster. Watson says he will "document the campaign" against Japanese whaling in Antarctic waters. The Steve Irwin is captained this season by former first officer Siddharth Chakravarty of India. Now two interlinked battles are underway � in the courts and at sea, where ships from both sides are maneuvering to block each other. 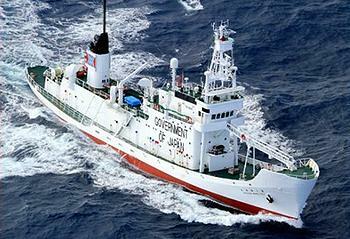 On January 31, the Japanese whaling security ship Shonan Maru No. 2 entered the Australian Economic Exclusion Zone around Macquarie Island, chasing the Sea Shepherd ship, the SSS Bob Barker. The Bob Barker headed for World Heritage listed Macquarie Island to lose the Shonan Maru No. 2 and escaped the Japanese vessel on Friday. Captain of the Bob Barker Peter Hammarstedt said, "The Shonan Maru No. 2 is an integral part of the Japanese whaling program. On board are armed storm troopers from the Japan Coast Guard whose sole mission is to violently prevent my crew of whale defenders, many of whom are Australian citizens, from upholding Australian domestic law and international law protecting whales." The Australian government officially notified the Japanese government to order the Shonan Maru No. 2 to remain outside of Australian territorial waters, including the waters around Macquarie Island. Since 2008, the Japanese whaling fleet has been in contempt of an Australian Federal Court order that prohibits them from killing whales in Australian territorial waters. Despite the ruling, Japan's Institute for Cetacean Research announced that it intends to kill nearly 1,000 minke and 50 endangered fin whales during its 2012/2013 whale-hunting season in the Southern Ocean. Only the Yushin Maru No. 2 remains with the factory ship Nisshin Maru and both vessels are far north of the whaling area and running from conservationist vessels. Co-Campaign Leader Bob Brown said, "The first 24 hours of contact with the whale poachers have been a victory for Sea Shepherd and a complete loss for the Japanese whaling fleet. I am delighted to report that not a single whale has been harmed so far." The speedy Sea Shepherd ship Brigitte Bardot has chased the Japanese whaler Yushin Maru No. 3 some 300 miles to the south. Today, a lawyer for the whalers is threatening the Sea Shepherd with contempt of court action, claiming the Brigitte Bardot breached the order granted by a U.S. appeals court that restrains Sea Shepherd vessels from approaching within 500 yards of Japanese whalers. 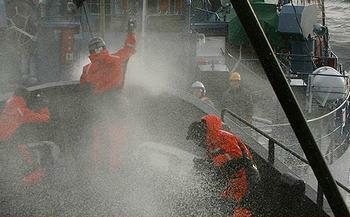 The December 17, 2012 injunction issued in Seattle, Washington by U.S. Ninth Circuit Court of Appeals states, "Defendants Sea Shepherd Conservation Society and Paul Watson, and any party acting in concert with them, are enjoined from physically attacking any vessel engaged by Plaintiffs the Institute of Cetacean Research, Kyodo Senpaku Kaisha, Ltd., Tomoyuki Ogawa or Toshiyuki Miura in the Southern Ocean or any person on any such vessel, or from navigating in a manner that is likely to endanger the safe navigation of any such vessel." Kyodo Senpaku Kaisha operates the whaling fleet for the Institute of Cetacean Research, a government agency, while Ogawa and Miura are believed to be senior officers. The injunction responds to an appeal by the Institute for Cetacean Research against the decision of a U.S. District Court judge, who refused to grant an injunction. The injunction will remain in place until the court decides on the merits of the Japanese case opposing Sea Shepherd in Washington State, where the U.S. chapter of the group is based. The whalers' lawyer claims that, in violation of the injunction, the SSS Brigitte Bardot came within 20.25 yards of the Yushin Maru No. 3 on January 29. Today "The Age" reports that the group's Melbourne lawyer takes the position that Sea Shepherd Australia is responsible for the group's Antarctic campaign and the Australian chapter is not subject to the restraining order of the U.S. court. 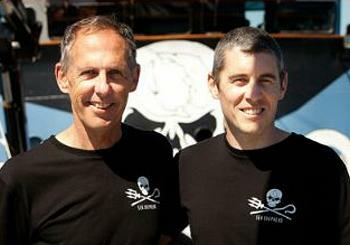 The U.S. Sea Shepherd Conservation Society has no shares in, nor control over, the Australian chapter, which is now run by Australians � Hansen and Bob Brown, the former senator and leader of the Australian Greens. Watson was arrested in Germany last May on a 10-year-old Costa Rican warrant, issued after a Sea Shepherd vessel he commanded intercepted a Costa Rican shark-finning vessel and was escorting it to a Costa Rican port. The Guatemalan government sent a gunboat to force release of the shark fishing vessel, while Costa Rica charged Watson with attempted murder. Costa Rica has since banned shark finning. Watson jumped bail and left Germany on July 22, 2012, saying that the Costa Rican warrant was a maneuver intended to deliver him to Japan. At the request of Costa Rica, Interpol has issued a Red Notice asking for information about the whereabouts of the 62-year-old who holds dual citizenship in the United States and Canada. Brown has been a conservationist for decades, both before and during the time he represented the state of Tasmania in Parliament. 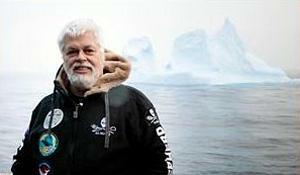 "I am honored to serve the great whales of the Southern Ocean and Sea Shepherd in this way," Brown said. "My admiration for Paul Watson is inversely proportional to the Japanese government's anger at Sea Shepherd's success at preventing the slaughter of almost 4,000 whales in recent years." The Discovery Channel's Animal Planet's Emmy-nominated show "Whale Wars" has documented the Sea Shepherd's whale defense campaigns for the past five years and is also onboard this season.